It was popular to roast apples at the hearth and necessity being the mother of invention we find this ingenious device designed for such a purpose. We must admit we've never seen another like it. 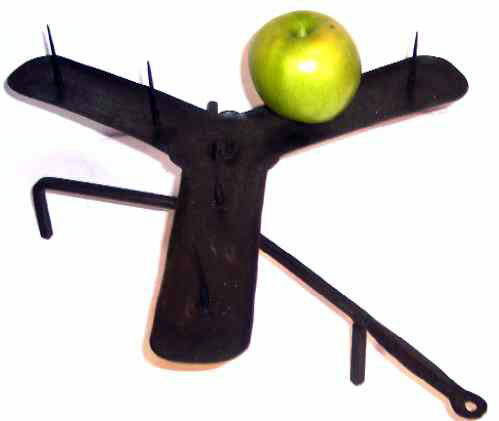 This three legged hand-wrought Apple Roaster with its center shaft-mounted 3 branch rotating device-like tray, each with two spikes on which to impale the apples, and each branch having curled borders to retain the juices. The support mechanism is forged from square cross section stock. One of the legs is fastened to a longer support which is forged into a flat handle ending and further flattened to form an "eye" for hanging when not in use on the hearth. The 3-Branch rotating tray is approximately 14 inches on each side and the overall length to the end of the handle is 18 inches. Dating to the late 1600's, early 1700's this Apple Roaster is a rare survivor!